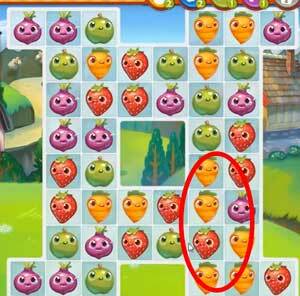 These Farm Heroes level 45 cheats and tips will help you beat level 45 of Farm Heroes. 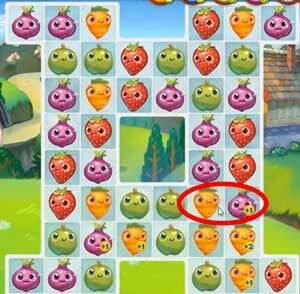 The objective of Farm Heroes level 45 is to collect 38 carrots, 21 onions, and 21 strawberries in 10 moves. 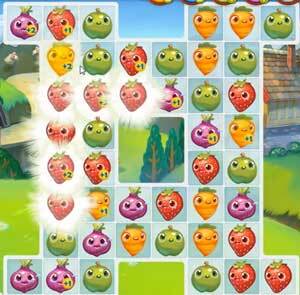 In Farm Heroes Saga level 45 you have 10 moves to collect 38 carrots, 21 onions, and 21 strawberries. The layout of this level is similar to level 44. You don’t have the advantage of the grass, and though you need less resources, you also have less moves to collect them. Plan out your moves so that you can collect the most resources with each move you’ll want to aim for an average of 8 resources per move, including any cascades. If you make your moves at the bottom of the board, there’s a higher chance that cropsies on the top will fall and make their own matches. Try to collect any resources at the bottom before moving to the very top, unless you see a special move at the top that might be ruined if you don’t use it right away. Making matches of 4 or more can help get you lots of bonuses if the match is near resources you need. Look any matches that will help improve your resources, especially if the matches themselves are resources you need.